It wasn't long after I caught the fountain pen bug that I wanted to start carrying one with me at all times. It didn't take long after that to discover that the Kaweco Sport series is the de facto standard for pocket fountain pens. One of my first fountain pen purchases was a Kaweco Ice Sport. It's a reliable writer and served me very well as my first pocket pen. As my interest in the hobby grew, the Ice Sport also let me get my feet wet with some eye dropper conversion fun. Before long, I set my sights on an upgrade from the plastic body of the Ice Sport to the aluminum goodness of the Kaweco AL Sport. With a street price in the $75 range, the AL Sport was more than twice what I had spent on any other pen at the time. (Ah, the good old days.) But I viewed it as a pen that I would likely use daily and cherish for years to come. After a few successful months of carrying my Ice Sport daily without losing it or sending it through the washing machine, I pulled the trigger on an AL Sport. 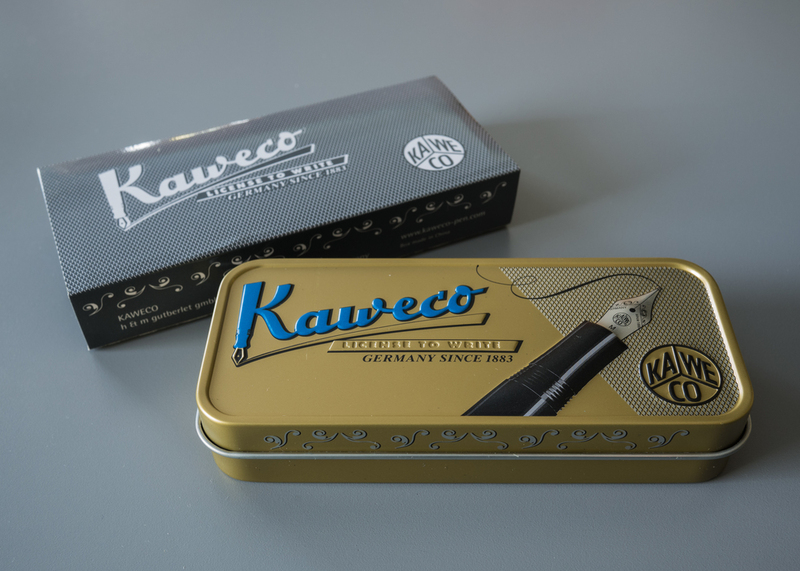 Kaweco does a great job with its packaging. The AL Sport came in a retro-style metal box. It's definitely a keeper. Once I opened the box, however, things got off to a rocky start. The first thing I noticed was that my AL Sport would not post correctly. It had a straight metal-on-metal feeling without the proper friction to hold the cap in place. The cap just rattled around. Eventually, I discovered a small rubber gasket in the box and deduced that it was supposed to have a permanent home in the cap. I tried jamming it in there, and after a few pop-outs it eventually housed itself properly. It was a discouraging start from something I was counting on for years of service, but I forged ahead. 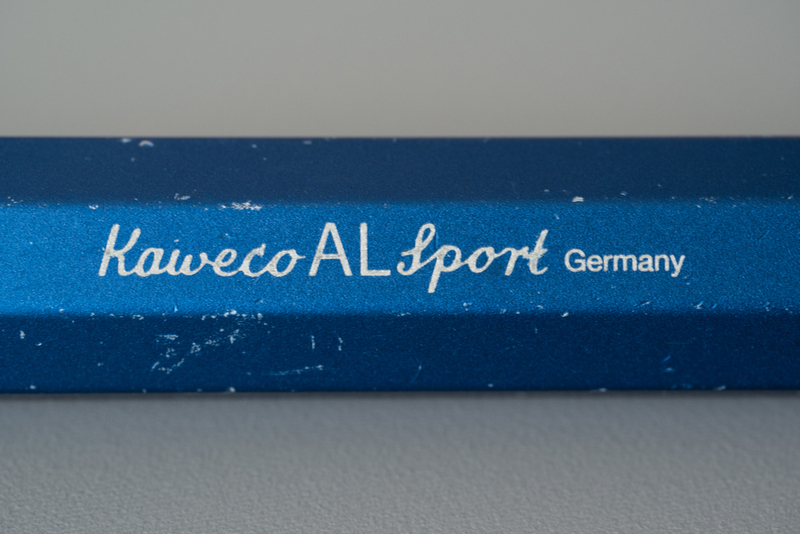 The Kaweco Sport pens have a very distinctive design, and the higher quality material in the AL Sport adds to the appeal. I opted for the blue matte finish, and it's a nice mid-range shade of blue. While there are some very nice Kaweco Sport pen sleeves available for purchase, I chose not to baby mine. I decided to find some enjoyment in watching it wear over time. Kaweco now offers a "stonewashed" version of the same pen for those who want to take a shortcut to the worn look, but I'm kind of proud of that fact that I'm earning my wear the old fashioned way. 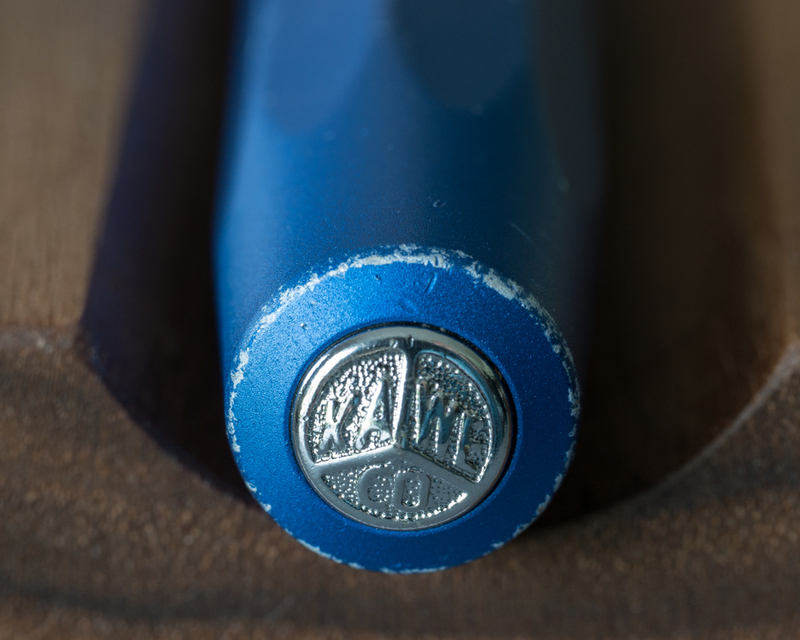 Kaweco offers an optional clip for the Sport pens. It works well, but I prefer to use the pen without it. Initial cap issues aside, the AL Sport feels like a high-quality pen. The aluminum exterior is not just a veneer. It's solid. 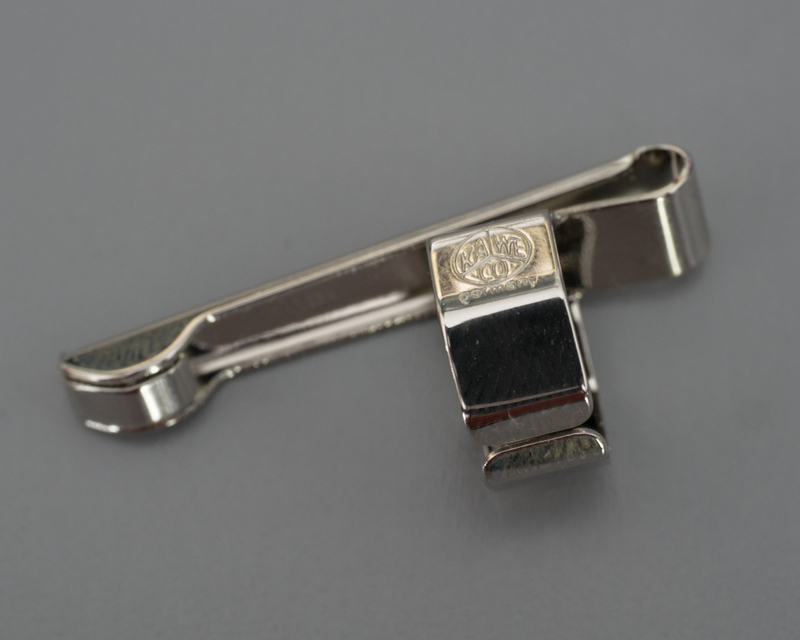 The threads have a sturdy, machined feel to them but also screw and unscrew smoothly. After a minimal amount of use, it felt very comfortable to pull the pen out of my pocket, unscrew it with a couple of twists, and post the cap without really looking at the pen. Reversing the process requires looking down to aim for the cap but feels similarly natural. The idea that I wouldn't like how this pen wrote never even occurred to me. After months of using my Ice Sport happily, I just assumed that everything about the AL Sport would be even better. While I was pleased with the overall aesthetics and design of the pen, it wrote terribly for me. I was constantly hampered by bad starts and skipping. I experimented with different inks with no success. Since Kaweco replacement nibs are relatively inexpensive, I eventually decided to purchase a replacement nib in case my original one was a dud. I started by ordering a replacement for my original fine nib. The results were about the same. Next, I tried ordering a medium nib, and the results were even worse. It was an incredibly frustrating experience. I continued carrying the pen daily for a while, hoping that it would break in a bit over time. But I eventually got fed up, put it on the shelf, and started using a Pilot Kaküno as my pocket pen. It was a downer to go back to a plastic pen, but the writing experience was orders of magnitude better (at less than a quarter of the price). Back in April, Jeff Abbott wrote a post over on The Pen Addict about his own challenges with the AL Sport. The similarities between his experience and my situation were uncanny. After reading Jeff's post, I had a fleeting motivation to try adjusting my nib on my own. However, the thought of how angry I would feel if I threw even more time and money at this problem with no guarantee of success kept me from acting for several more months. I briefly considered cutting my losses with the AL Sport and ordering a Franklin-Christoph Model 40 Pocket. 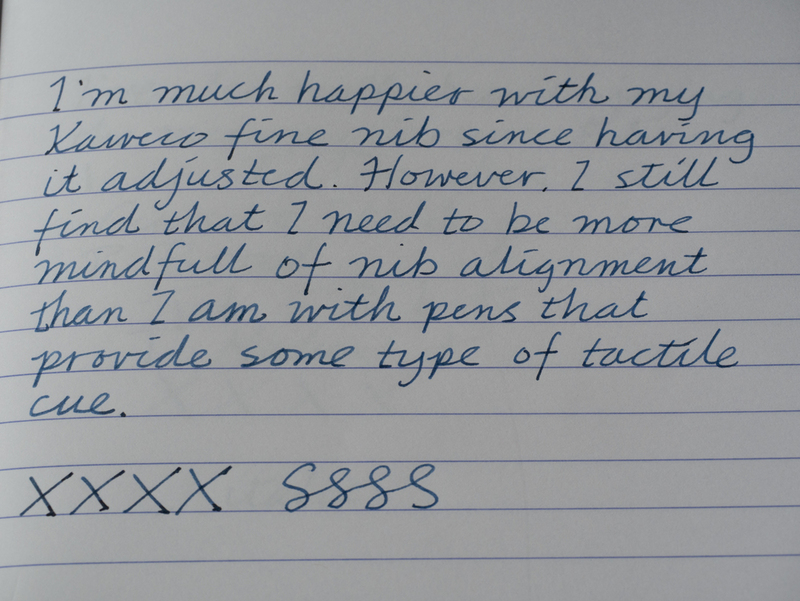 It's an absolutely stunner, and with the Masuyama nib options, there's a virtual guarantee that it will write well. But I knew I would absolutely want to baby something as gorgeous as the Model 40. I still preferred my original approach of a nice, sturdy pen that I didn't mind knocking around in my pocket a bit. I ultimately decided to take one more crack at getting the AL Sport to work for me. Rather than leaving it in my own novice hands, I decided to seek professional help for my final stand. After a fair bit of research into the various nibmeisters out there, I sent an e-mail to Shawn Newton about my situation. Even though it happened to be the Fourth of July holiday, he was quick to respond. Soon after, a plan was in motion. 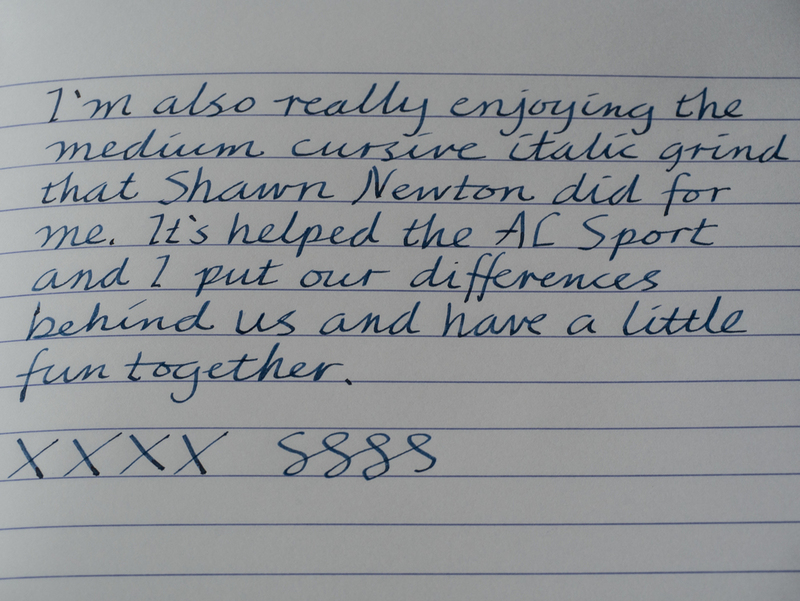 I decided to send Shawn the pen with both a fine and medium nib. I asked him to do a straight adjustment on the fine nib and grind the medium nib into a cursive italic. Shawn gave me a great deal, charging me his normal $30 rate for the custom grind and throwing in the adjustment of the fine nib for free. (He normally charges $20 for an adjustment.) He is extending this offer to others as well, so if you are in need of some nib work, get in touch with him. Shawn was very easy to work with. He suggested that I send along some samples of my go-to papers for him to test with, so I loaded everything into a box and shipped it off. A couple of weeks later, it all came back ready for a fresh start. I am really happy with both the adjustment and the custom grind. I went in expecting the fine nib to be my daily workhorse, since it's a better option for Field Notes and the lousy paper I tend to encounter out in the wild. The adjustment made a big difference. I am also really enjoying the medium cursive italic. I'm still honing my skills with it, but I will definitely be swapping it in for a change of pace on a regular basis. 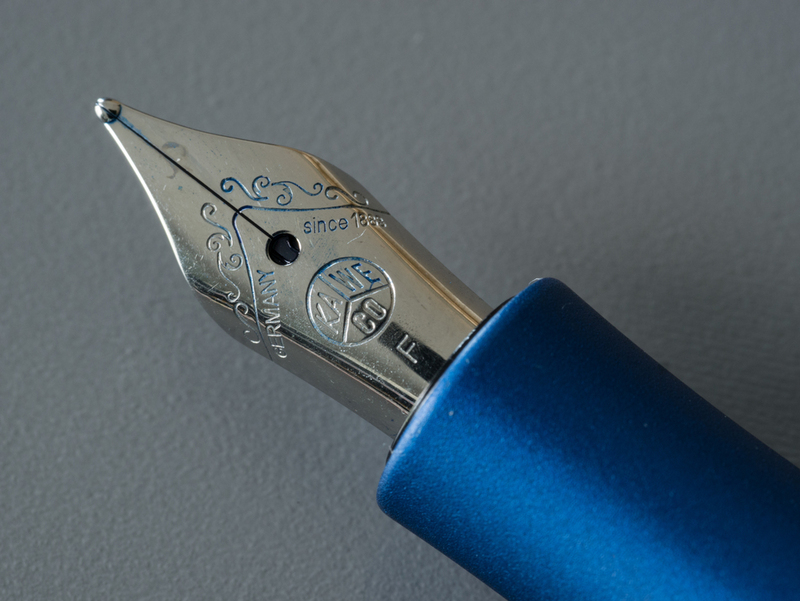 While the Kaweco is very compact when capped, it posts to a comfortable writing length. As a rough comparison, the AL Sport posted is roughly the same length as a Lamy Safari or AL Star unposted. Though I post the AL Sport most of the time, I do use it unposted for the occasional quick note or signature with no problems. 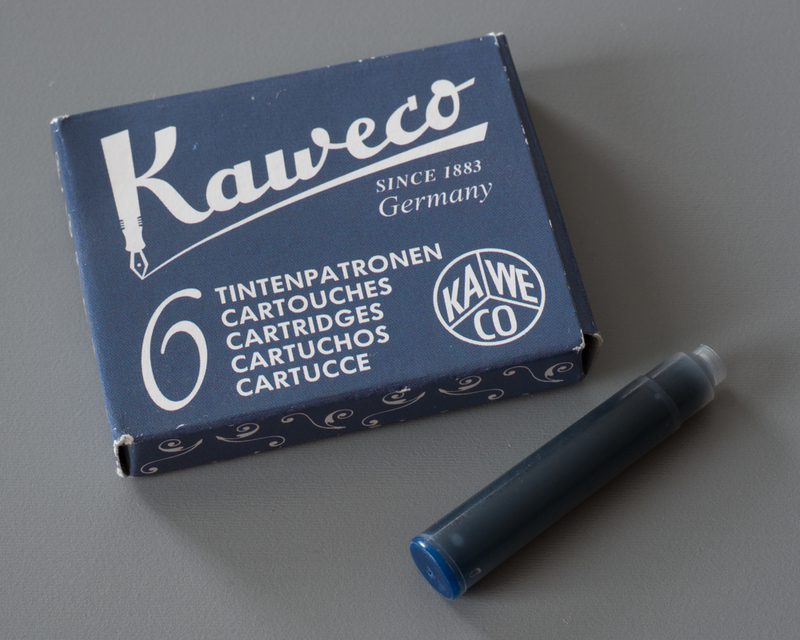 The AL Sport takes small standard international cartridges, and Kaweco offers its own line of them in a variety of colors. I've only tried the blue and blue black. They are both good but not great. I prefer more saturated inks, so I generally fill empty cartridges with a syringe. Kaweco offers a squeeze converter as well, but I've found it to be spectacularly painful to use. The syringe fill approach works well enough for me, but I'd love to find a nice blue or blue black ink that comes in a short international cartridge for weeks that I am traveling. (I don't really feel like having the ink syringe conversation with airport security.) If you have any suggestions for either cartridges or a better third party converter that fits this pen, I'd love to hear them in the comments or on Twitter. The AL Sport is very convenient to disassemble and clean. 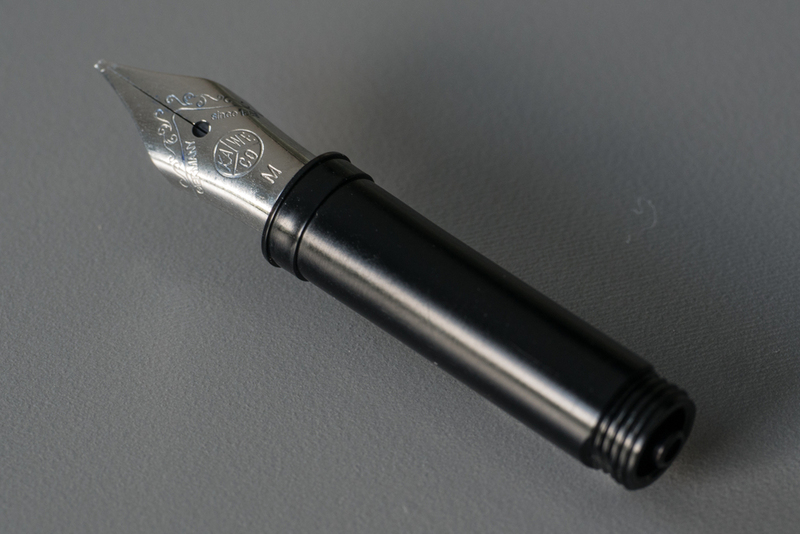 The nib unit unscrews easily with a few twists. My bulb syringe also forms a good seal with the feed, so flushing the nib unit out is very easy. I'm kind of "particular" about not using my nibs until they are fully dry after cleaning, so I love the fact I can change inks in the AL Sport in minutes by just swapping in my alternate nib while the one I just cleaned dries. This is particularly helpful for a pocket pen, since I never have to be without it. The AL Sport is still not at the top of the list of pens I reach for if I'm at my desk with my full collection within reach. But I am much happier with it after having some expert nib work done on it, and it's firmly back in position as my daily pocket pen. 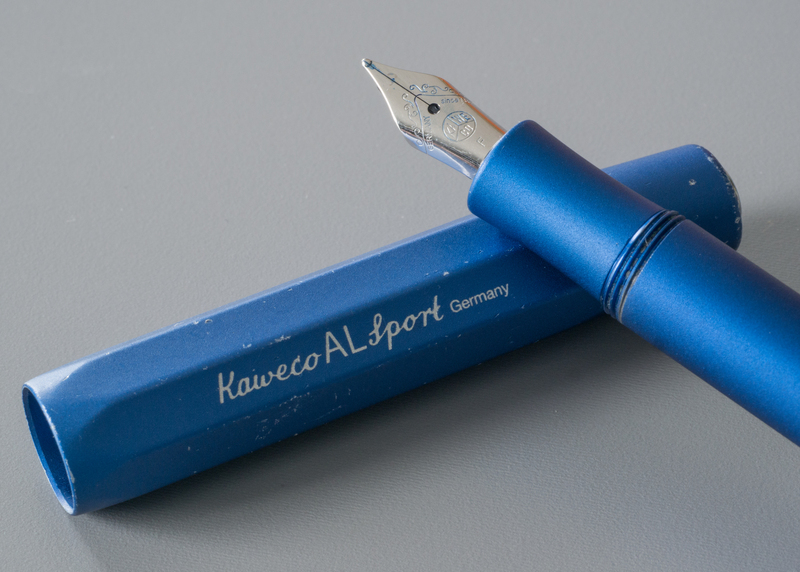 That said, my experience with the AL Sport has definitely soured me on the Kaweco brand. The poor quality control I experienced with both the rubber gasket in the cap and the three nibs I purchased is not acceptable for a $75 pen. While I won't rule anything out, I don't expect that I will buy another Kaweco pen any time soon. Now that I do have the AL Sport writing properly, there is a lot that I like about it. The overall design and solid aluminum body is exactly what I was looking for in a pocket pen, and I am really enjoying watching it wear over time. If you appreciate similar attributes, I wouldn't discourage you from buying this pen. However, I would recommend going in with open eyes that you may need to incur some additional effort and expense to get it writing the way you want it to.